Why should companies engage with the Lead the Change! Initiative? – As an opportunity to network with other industry leaders and learn about some of the key challenges (and opportunities) facing all of us. – To be advocates for innovation and positive impact, most relevant topics for attracting and retaining top talent. 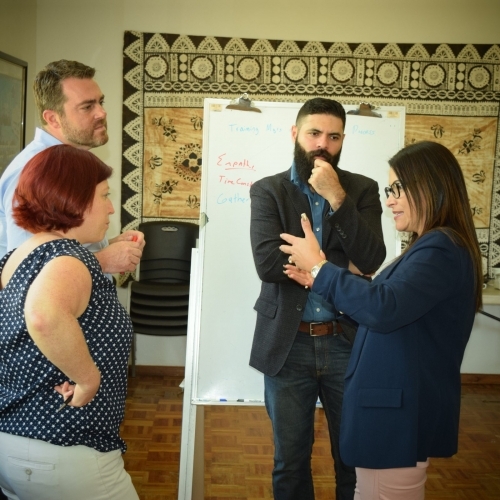 – To experience interactive workshops on cutting-edge topics and learn about how the UPEACE Centre for Executive Education can support companies in their talent development needs. This initiative, launched in March 2018, recognizes that the key priorities of the business sector are aligned with the Centre’s priorities – a more just, sustainable, and equitable planet where every individual has the opportunity to flourish in our global economy. While we know that this is still an ideal, the seventeen Sustainable Development Goals provide a common guiding framework. June 2018: A morning workshop on the topic of ‘Working Across Cultures and Generations’ which will have participants reflect upon and understand the differences, challenges, and the opportunities implied by a generation brought up with smart phones and virtual classrooms.